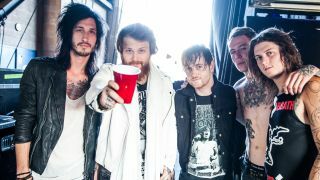 Danny Worsnop is back in Asking Alexandria after weeks of speculation over the band’s future. Guitarist Ben Bruce says the group’s original singer has rejoined after Denis Stoff – who replaced Worsnop around 18 months ago – broke off contact with the band following their recent tour dates, which Bruce sat out because of the birth of his daughter. With no further contact forthcoming, Bruce says the band had no option but to move on without Stoff – and they reached out to Worsnop. Bruce says: “You all know all the rumours and crazy speculation going on online and social media – just to get straight on with the point, we have parted ways with Denis. “There are a number of reasons for that, most of which I’m not gonna go into detail on here live on this chat. “We didn’t kick Denis out of the band, he just stopped talking to us. We tried to organise a video shoot for Send Me Home. Everything seemed fine and he just stopped responding. I texted him a bunch and sent loads of emails, no response whatsoever. We were quite confused. With their Sumerian 10 Years In The Black tour due to start this month, Asking Alexandria had to decide whether to replace Stoff or call time on the band. Bruce adds: “The reason we started this band in the first place was because we are five best friends who loved being around each other. That’s why we started this band and that’s why we are continuing this band. “Over the last few months we have rekindled our relationship with Danny. What happened in the past sucked and it hurt us. I’ve said things, Danny said things. But at the end of the day we have been best friends for a decade. That’s why this is the move that’s right for us. This is full circle, right back where we started. Bruce also claims that, when they brought Stoff into the band in 2015, they were told things about the singer that he now says they should have heeded. Worsnop left Asking Alexandria to concentrate on his other band, We Are Harlot. He also launched a solo career.